The tributes to the late Prof. Bongani Mayosi over the past month were consistent in describing his work as directed to serve and benefit people living in poverty. His concern was that diseases of the poor were not receiving enough attention by science and, as a cardiologist, he was committed to contributing to a better understanding of how cardiovascular diseases affect or manifest in those living in poverty. One field to which he made profound contributions was that of rheumatic heart disease – a “disease of poverty” brought on by an easy-to-treat strain of bacteria that affect especially children and young people who grow up in conditions of poverty. Prof. Mayosi’s legacy in this field today stretches from clinics on the Cape Town Flats to the African Union and beyond. A man who regarded the impact of his research on the poor as the central tenant to his work; a man who nurtured, supported and allowed those with whom he worked to branch out. That is how Prof. Bongani Mayosi is remembered by his colleagues and former PhD students, Associate Professors Liesl Zühlke and Mark Engel, who worked with him for the past 10 years on research on rheumatic fever and rheumatic heart disease (RHD). RHD is the most prevalent heart disease in children in developing countries, although it is entirely preventable. In South Africa, it affects an estimated 2% of all children (0 – 17 years) who live in the poorest 20% of households (quintile 1). RHD, characterised by damaged heart valves, may develop after repeated episodes of rheumatic fever, which follows a bacterial throat infection known as “strep throat”. Poor housing and overcrowding, malnutrition and a lack of access to health care are some of the determinants of rheumatic fever and subsequent RHD. As a key challenge was the lack of data on these diseases, Prof. Mayosi raised funding to set up research sites in Bonteheuwel and Langa, two peri-urban communities of the Cape Town Flats. Here, 2 500 children from 23 schools were tested for the early signs of abnormal heart valves and thus the possibility of developing RHD. Mark Engel, an epidemiologist who was the research project manager, built on this work for his PhD, as did Liesl Zühlke, a paediatric cardiologist. They both stayed involved in the project when the research was repeated in Ethiopia, where 2 700 children were tested, and then expanded to other African and Asian countries. “This was a multi-pronged study”, explains Liesl, “it wasn’t just an echo study, but also involved the community, advocacy and awareness about RHD. 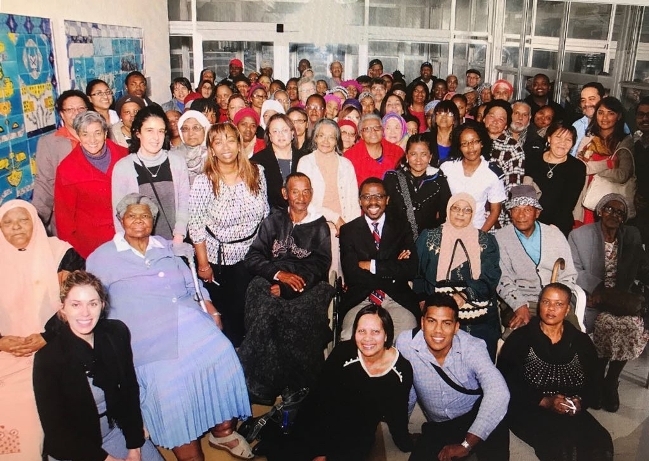 One of the last days that Prof. Mayosi was in the community was in August 2017 – during Rheumatic Heart Disease Week – when he presented to the community at the Vanguard clinic. He was extremely involved in the community and in involving them in the research”. But this research on RHD was designed to reach much further: the Bonteheuwel and Langa project was set up as a demonstration site that served as the template for rolling out similar studies elsewhere in Africa, clarifies Mark. Even without funding, the work commenced and grew in many parts of Africa: “Aspects of the protocols that started out as a research project in our work have been adopted into standards of practice in some participating countries”, says Mark. To date, 25 sites in 12 African and two Asian countries have been enabled and capacitated to undertake RHD research as part of the Global Rheumatic Heart Disease Register, or REMEDY study, which was led by UCT. This study resulted in widespread acclaim for highlighting the poor outcomes of this disease and the significant gaps in evidence-based interventions. Prof. Mayosi and his team participated quite vigorously at various levels of the World Heart Foundation (WHF), particularly around promoting RHD. Under his leadership as the chair of the WHF Working Group on Rheumatic Fever and Rheumatic Heart Disease, they contributed to awareness of this disease of poverty at global level. In 2013, the WHF adopted a position paper on the prevention and control of RHD; and in May this year member states of the World Health Organisation adopted a global resolution on rheumatic fever and RHD. Leading this push for a global resolution was RHD Action, co-founded by the WHF and Reach – a scientific and technical RHD advisory initiative of which Prof. Zühlke is the current president. And only last month, experts from the world’s leading heart surgery organisations issued a joint statement, known as the “Cape Town Declaration”, that calls for improved strategies to treat RHD, with Prof. Mayosi as a co-author and signatory. The only way to treat advanced RHD is through open-heart surgery, which is costly and risky. However, primordial prevention strategies can eliminate rheumatic fever and RHD by addressing the underlying determinants of these diseases, such as living in overcrowded and badly ventilated housing, and poor access to health care. While these are longer-term goals, an immediate strategy is to ensure parents understand the link between strep throat and future heart disease in children. The reality, though, is that few parents and caregivers in South Africa understand this link, according to Prof. Mayosi in a Health24 article in 2013. A more disconcerting reality, as Mark points out, is that few researchers focus on this work. He is currently the only researcher in South Africa that studies the streptococcal bacteria that cause strep throat and, together with Liesl and their colleagues, are part of only a few voices who are raising awareness of the link between strep throat, rheumatic fever and RHD. A man of the stature of Prof. Mayosi’s has many legacies. For both Liesl and Mark it was how he took an interest in the work of others which did not necessarily fall in his field of research; and how he nurtured, supported and capacitated those whom he worked with. Prof. Mayosi was involved as a co-investigator on two of Liesl’s studies that relate to congenital heart disease and adults with congenital heart disease, “neither of which was his particular research areas but to which he provided critical scientific input. And, with everything he did, it wasn’t only about the science but also about building key research capacity. That was a very important part of what he did”, remembers Liesl. Article by Charmaine Smith, PII communication manager.